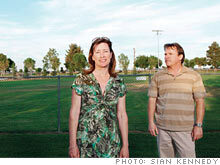 Chronic medical conditions may put a crimp in this couple's early-retirement plans. Cindy and Jim Hughes, Lancaster, Calif.
(Money Magazine) -- Jim and Cindy Hughes, both 47, are thinking about an issue most people don't confront until it's too late: health-care costs in retirement. With Type 1 diabetes, Jim is at increased risk for other ailments as he ages, "including heart, circulation, kidney, and liver problems," Cindy says. And she has her own issues, having been diagnosed recently with Crohn's disease, an intestinal autoimmune illness. The couple would like to retire at age 58. But can they afford to, given their chronic conditions? Jim, who works for the Department of Defense, will get retiree health benefits and a pension, but Cindy gets neither from her employer, a defense contractor. They do save $33,000 of their $200,000 income, and, by 58, will have $1.7 million, assuming a 6.5% average annual return, says Jacksonville financial planner Carolyn McClanahan, who's also a physician. That should get them most of the way, but there are still things they can do to ensure that they can maintain their lifestyle and cover the medical risks they face. 1. Save for insurance. After retiring, Cindy can -- and should -- get onto Jim's plan until Medicare kicks in. But she'll need $77,000 in total to cover premiums and deductibles, estimates planner Carolyn McClanahan. That means saving $550 more a month in a cash account (with a 2% yield). 2. Get covered for the worst case. Since their conditions increase the chances of needing nursing-home care, the couple should get long-term-care insurance to protect their nest egg, says McClanahan. The federal government offers a plan she thinks they'd qualify for in the next open enrollment. 3. Stay on a payroll. Even with Jim's pension, the couple can't maintain their lifestyle at safe drawdown rates, says McClanahan. To fill the gap, she suggests that they get part-time gigs until Cindy takes Social Security at 67. Bonus: "Studies show that people who stay engaged in meaningful work live healthier lives," she says. Thinking of relocating to get a better job? Tell us your story. Please send an email with a brief description of your situation and a photo to Donna Rosato at donna_rosato@moneymail.com. For the CNNMoney.com Comment Policy, click here.